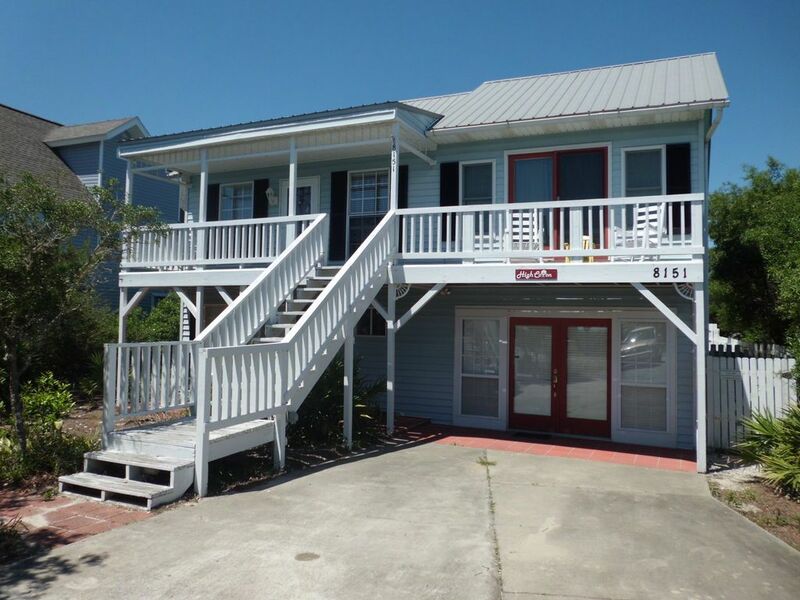 Cottage, 3 Bedrooms, 2.5 Baths, (Sleeps 8) Short walk to the beach. Directly on the North side of County Road 30-A and facing the Gulf of Mexico you will find a cute cottage sitting between two public beach accesses. The top floor consists of a roomy den with a big screen TV, dining room also with a big screen TV and game table, kitchen with breakfast nook, and 1/2 bath. Three bedrooms (1 king and 2 queens) and two baths are on the ground floor. 12 x 24 private pool (unheated) with an enclosed hot and cold water outside shower. Enjoy the gulf view from the covered front porch in rocking chairs, or relax on the deck off the kitchen overlooking the pool. Stairs lead down from the deck to the pool. There is an enclosed play area under the deck near the pool. The pool area is completely fenced. You will be pleasantly delighted with the gorgeous gulf view and easy beach access of High Cotton Beach Cottage. We are located in the middle of two public beach accesses 200 yards either direction (An easy 4 minute walk). You will find this 1500 sq.ft. beach cottage an attractive and comfortable accommodation for your family and hopefully a favorite summer vacation. There are TVs in all bedrooms, big screen TVs in den and dining area, WiFi internet, 2 DVD players, videos, games, puzzles, and books. There is a stackable washer and dryer in the laundry area. The kitchen is fully-equipped with everything you need and there is also an outside charcoal grill. We have a beach cart for you to load your beach gear into. There are 2 adult sized terry cloth robes in the master bath for your use. All you will need to bring is your food, beach towels, and shovel and bucket! High Cotton Beach Cottage is located on a quiet stretch of Scenic 30-A between Alys Beach and Camp Creek Lake. Visitors can enjoy the activities and amenities of Seagrove, Seaside, Alys Beach, and Rosemary Beach (without the upscale prices!). In the surrounding area you will find an abundance of natural beauty, quaint shops, and excellent restaurants along with your favorite outdoor activities such as golf, tennis, fishing, windsurfing,or paddleboarding. The bike path in front of High Cotton runs the length of Scenic 30-A -- there are many bike rental shops nearby or bring your own. Nearby Lake Powell has a public boat ramp great for waterskiing, jet skiing, and fishing. High Cotton Beach Cottage is the perfect spot to unwind and soak up the sun by the pool or on the miles of non-crowded beaches. High Cotton is located just 3 miles west of Rosemary Beach and 6 miles east of Seagrove and Seaside. Please email owner for most accurate map links. BEACH - BEACH- BEACH - Hiking, Biking, Golf (Camp Creek Golf Club-1 mile), Tennis (Watercolor, Seaside, and Rosemary Beach), Miniature Golf, Amusement Parks, Fishing, Shopping, Restaurants, Museums, Sightseeing, Swimming, Snorkeling/Diving, Boating, Waterskiing, Sailing, Stand-up Paddleboarding, Surfing, Windsurfing, Parasailing, Jet Skiing. Dr. Jay and Alice Walker both grew up in Anniston, Alabama and have lived there for almost their whole lives except for the time spent in Tuscaloosa, Birmingham, and Memphis during their college, dental and orthodontic school years. We have been bringing our family down to this part of the beach for 35+ years and when we looked at this house, just down 30A from a family place, we fell in love with it. We wanted to be able to share it with family, friends, and new friends that we haven't met yet! We love the large den and dining rooms with windows and doors letting in lots of sunshine, the spiral staircase, the front porch, and the pool. It's a great location, convenient to the beach, to Rosemary, Alys Beach and Seaside. Tiled master bathroom with shower. A second full bath serves the other 2 bedrooms. There is a 1/2 bath upstairs. Sheets, pillows, pillowcases, blankets are provided. We have towels, hand towels, and wash cloths for your use. Please bring your own beach towels. Roomy den with plenty of seating and large TV. Games, books, and puzzles are provided. Kitchen is equipped with all major appliances. In addition, we have toaster, blender, coffee maker, coffee bean grinder, hand mixer. Plenty of pots, cooking utensils, dishes, cups and glassware also. The dining area has seating for 6+, a big screen TV, and a small round table for playing cards and games. Big screen TVs in Den and Dining room. Smaller tvs in each bedroom. Balcony in front of the house as well as in the back overlooking the pool. Plenty of patio area around the pool. There is a small gated area with a swing and sandbox. Just three miles west of Rosemary Beach and six miles east of Seaside this vacation home is only a 4 minute walk to the public beach access. You will find various shops and restaurants just a few minutes away at Alys Beach, Seacrest and Rosemary Beach. In the other direction, check out Seagrove and Seaside for more shops, boutiques, and fun restaurants. Take advantage of bicycle rentals all up and down 30A and enjoy a leisurely bike ride up to your favorite coffee or sweet shop. Pier Park, a popular attraction for shopping and other amusements, is only 15 minute drive from High Cotton. There you will find shopping, restaurants, theaters and outdoor amusements.